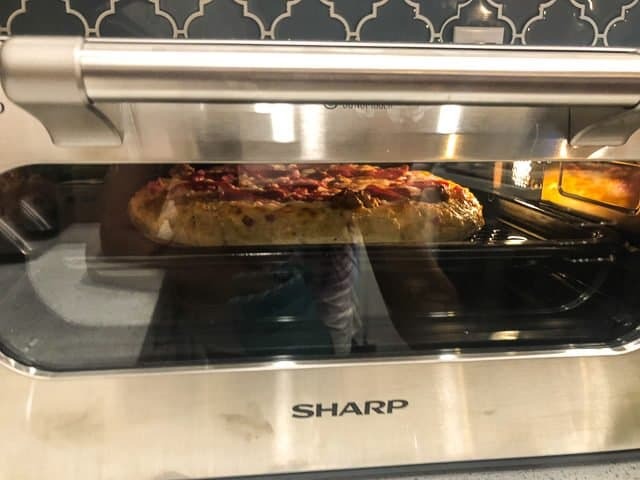 We tested the Sharp Superheated Steam Countertop Oven for 2 weeks in our kitchen, using it for cooking pizza, seafood, vegetables, toast and also for reheating leftover foods. 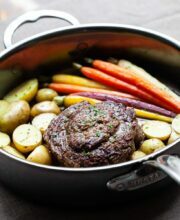 What is Superheated Steam Oven? The Sharp SSC0586DS Superheated Steam Countertop Oven is the start of a cooking revolution. 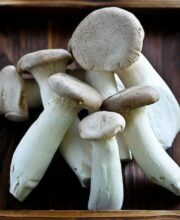 The innovation is simply that steam can be hotter, cook better, and promote healthy living. 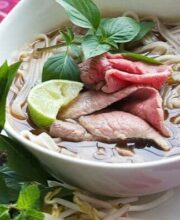 The combination of superheated steam and conventional, radiant heat in all cooking modes means that your food will be crispy and browned on the outside, moist and delicious on the inside. 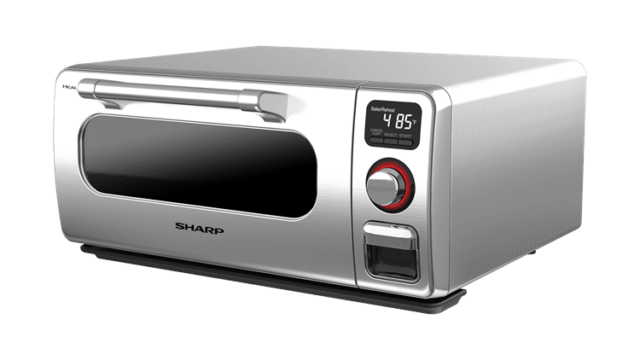 The Sharp® Superheated Steam Countertop Oven is a powerful, low-profile, pizzeria-style oven. 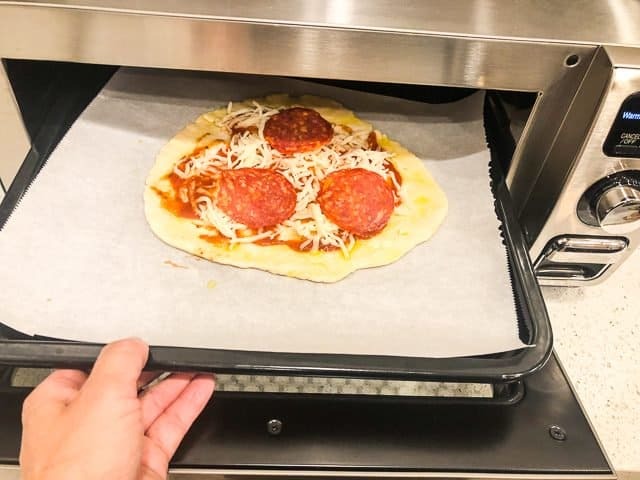 Roomy enough for a 12″ pizza or 9 slices of toast, the included Broiling Pan and Crisper Tray (12.5″x12.5″) give you more cooking area than a standard quarter-size sheet pan. 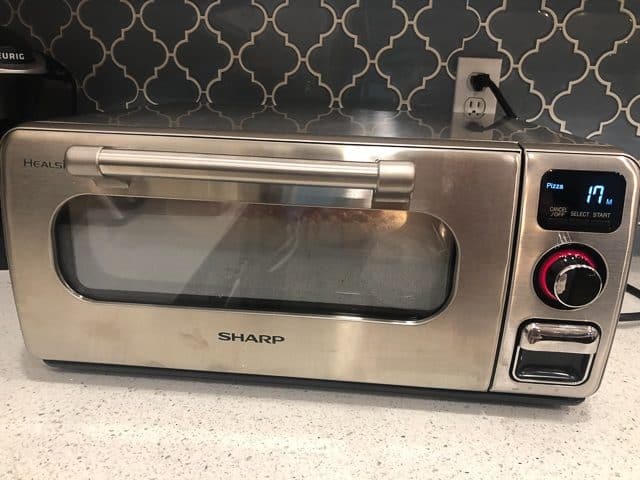 Right out of the box, we noticed that the countertop oven is unlike traditional “toaster ovens” – the Sharp oven is shorter, wider and longer. It reminds me of a pizzeria style pizza oven with its pull-down oven door and size. PRO: It’s huge! 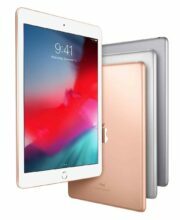 The trays are 12.5″ x 12.5″. 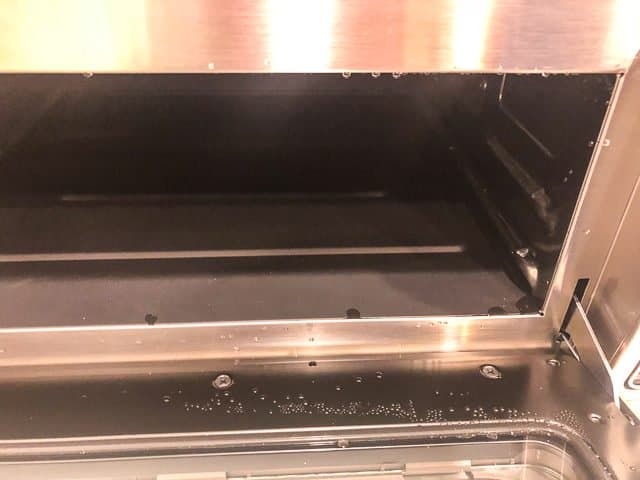 There are 2 very sturdy, heavy, metal trays, similar to what you would find in your regular built-in oven broiler). 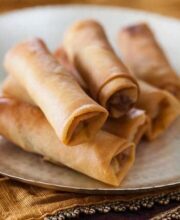 Good quality trays that will not warp. I actually have a countertop steam oven, made by Cuisinart, that we’ve been using for the past 2 years. 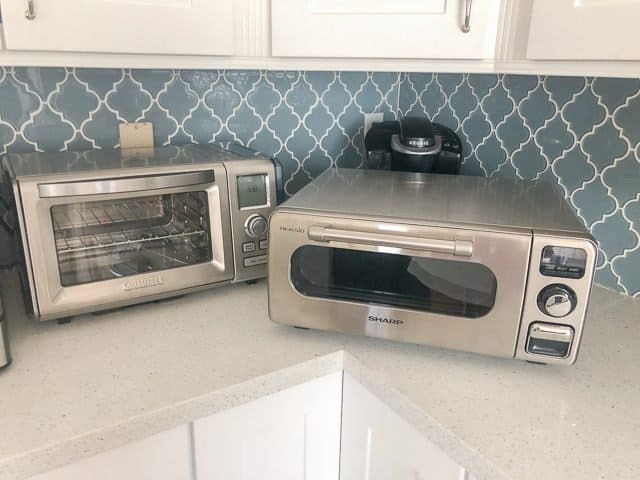 The Cuisinart is large toaster oven size. 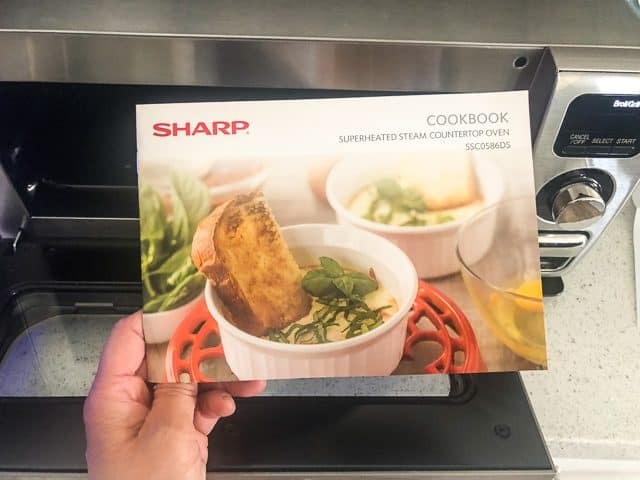 As you can see, the Sharp Superheated Steam Oven is quite a bit larger. It will take up quite a bit of space on your countertop. The Sharp Superheated Steam Oven has a small, plastic container that you fill with water. It’s easy to fill, no need to remove the lid, just hold it over your faucet, and insert it back into the oven. 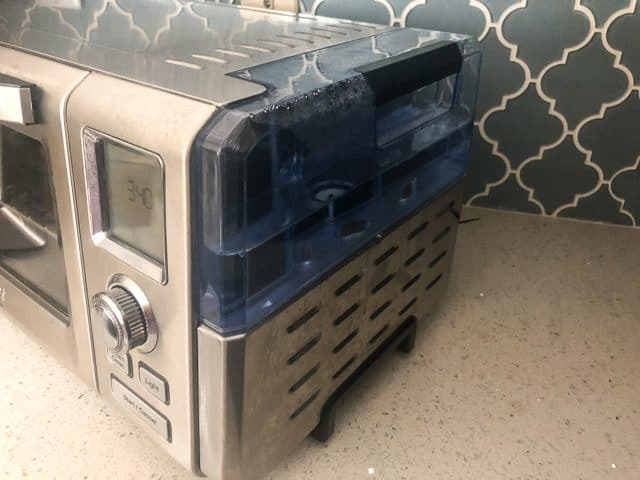 Cuisinart’s water chamber is double the size, and sits on the side of the oven. 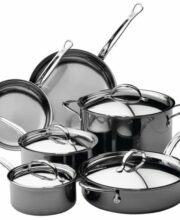 This is neither a PRO nor CON – the Sharp unit is so simple to refill, but the Cuisinart unit is larger but more of a hassle to refill. 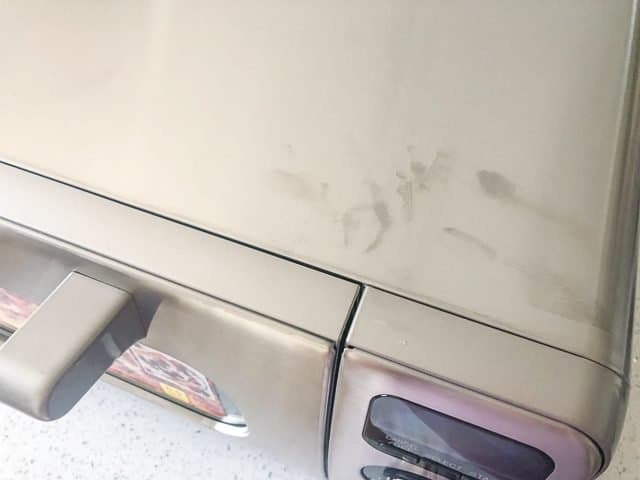 CON: I noticed the Sharp oven surface easily leaves fingerprints, but easily cleaned with rag. 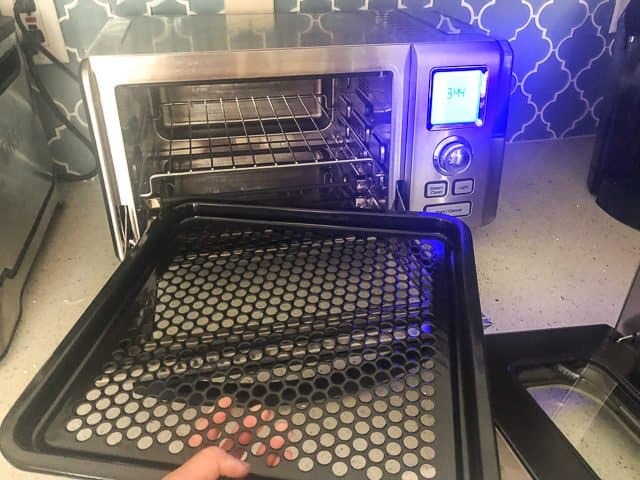 PRO: Look how much bigger the Sharp Superheated Steam Oven tray is! 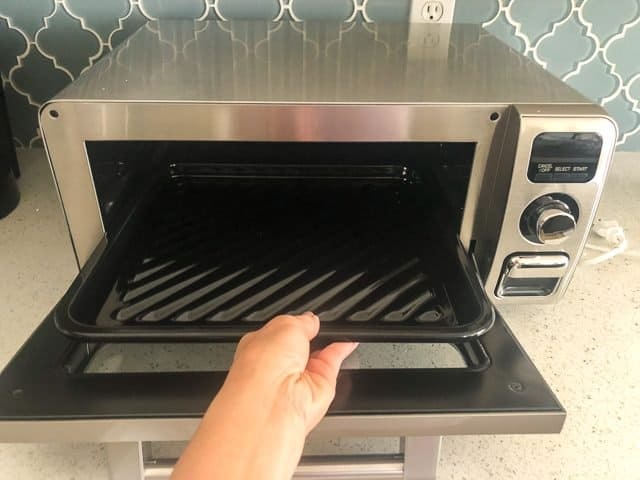 As I mentioned, the Cuisinart steam oven is more of a large toaster oven size (easily cooks food to feed 2 people, but not quite big enough to fit 4 servings of food). The Sharp oven will definitely hold enough food for 4 people – for example, 4 large chicken breasts AND space for vegetables on the tray. 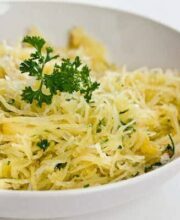 It comes with a very small pamplet of just a few recipes. 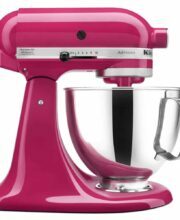 I would have liked to see more recipes for an appliance that features a new cooking method. 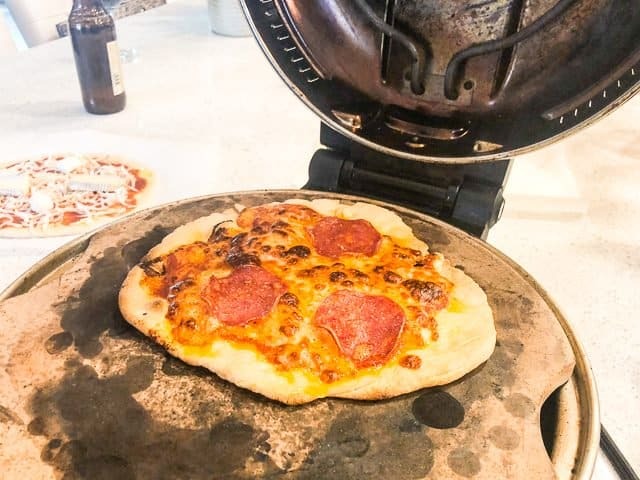 PRO: Look – it’s a full sized, frozen pizza! 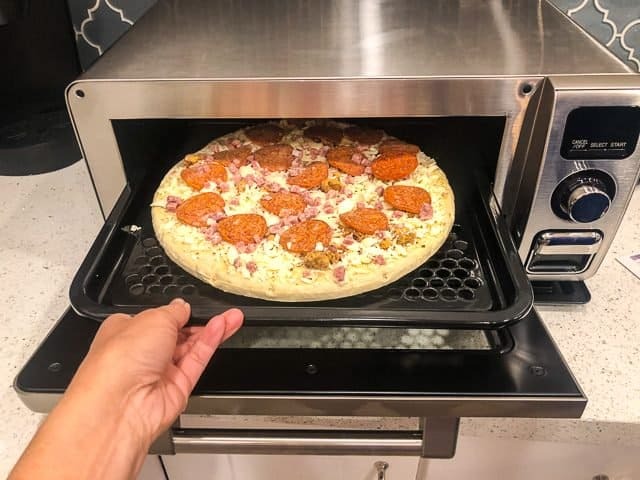 PRO: There’s NO pre-heating required. 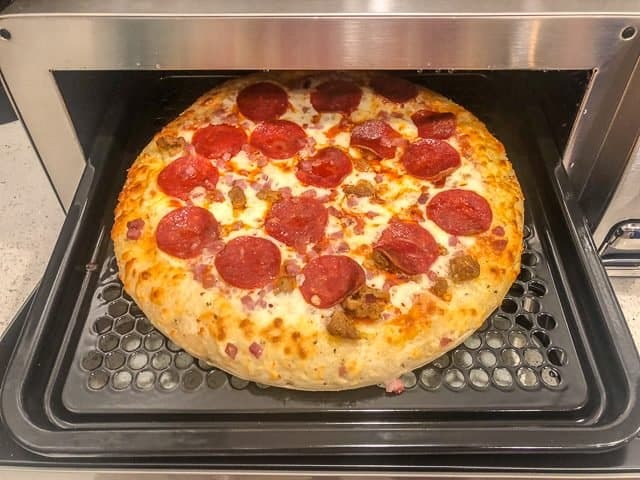 The steam heats up the oven so fast that you don’t need to spend time pre-heating. 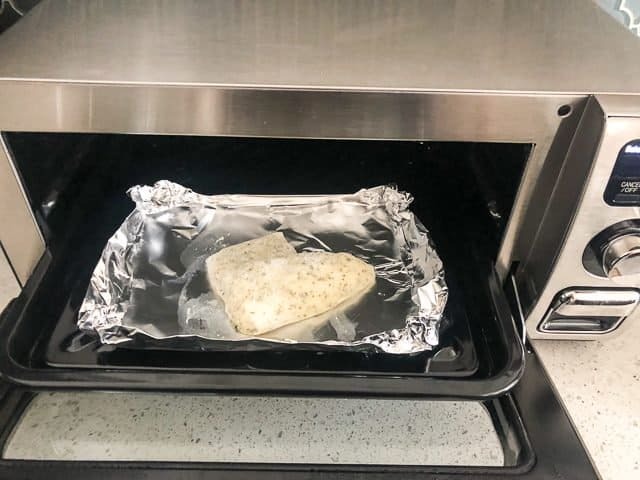 Frozen food goes directly in the oven. After a few minutes, you can start seeing the steam form. 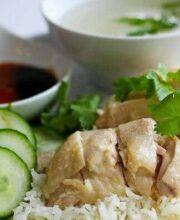 The steam is being super heated to cook the food, while keeping the food moist. 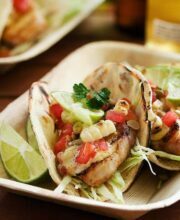 Radiant heat will brown or crisp foods. Came out beautifully browned on crust. 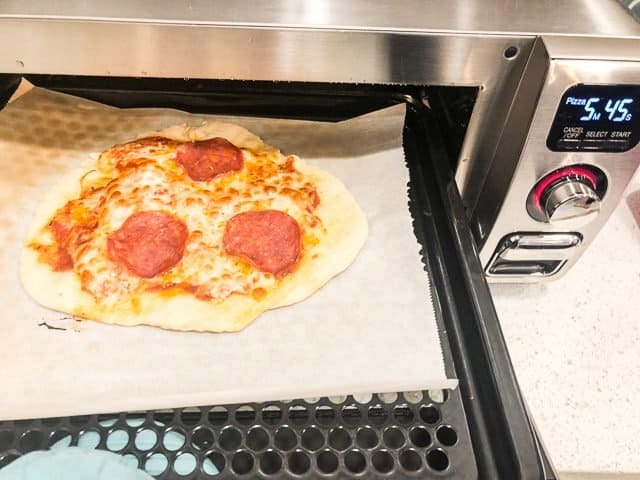 We tested the Sharp Superheated Steam Oven with homemade pizza dough. CON: We experimented several different times, but I couldn’t get the crust to brown. The cheese melted just fine, but the dough didn’t brown correctly. PRO: Vegetables in the Sharp Superheated Steam Oven worked pretty well. 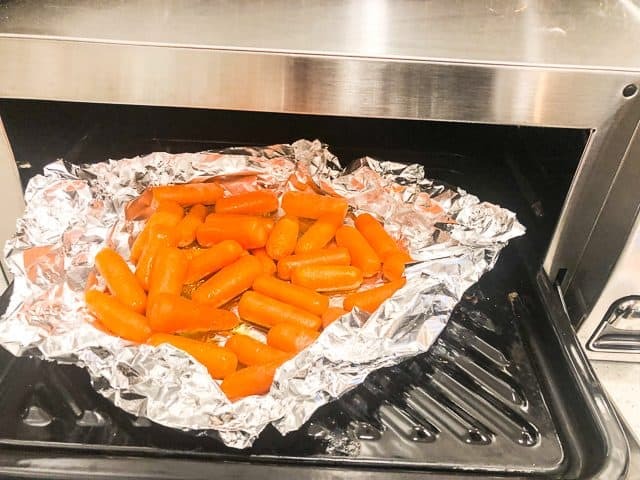 Baby carrots drizzled with olive oil roasted beautifully – the steam kept the carrots from drying out. 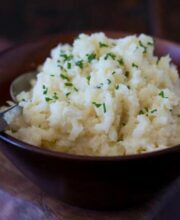 But the real power of the oven came when we cooked seafood, something that can over-cook or dry out too quickly in a regular oven. 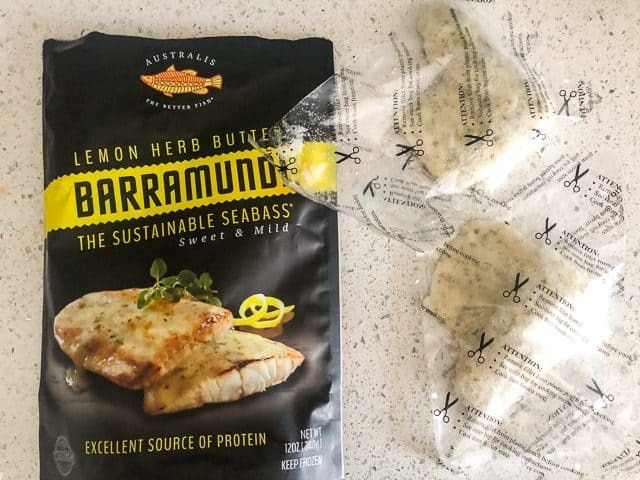 Frozen Barramundi fish with lemon herb butter. No need to defrost. Into the oven it goes. 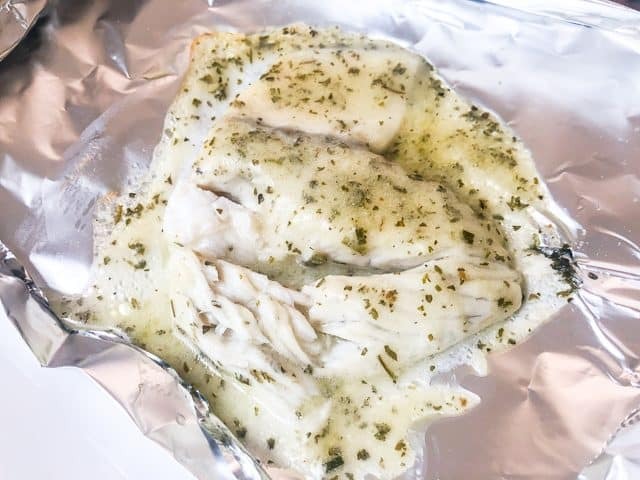 I made a small tinfoil boat for the fish to keep the lemon herb butter contained. PRO: Super flakey, incredibly moist. 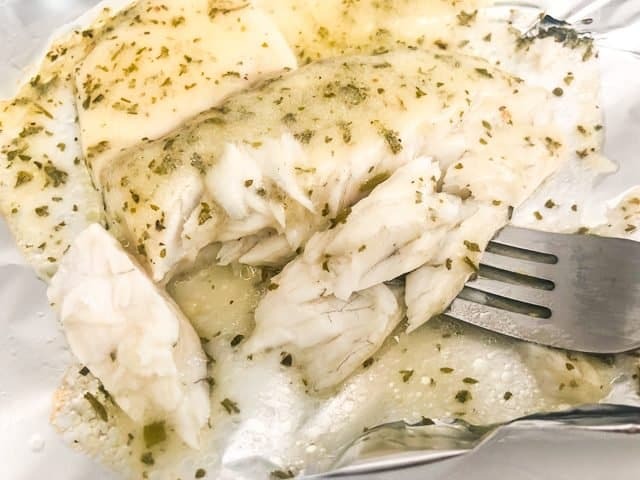 In a regular oven, the lemon herb sauce would have bubbled dry. 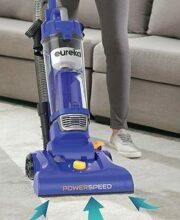 PRO: Cleanup is really easy. Just wipe dry. 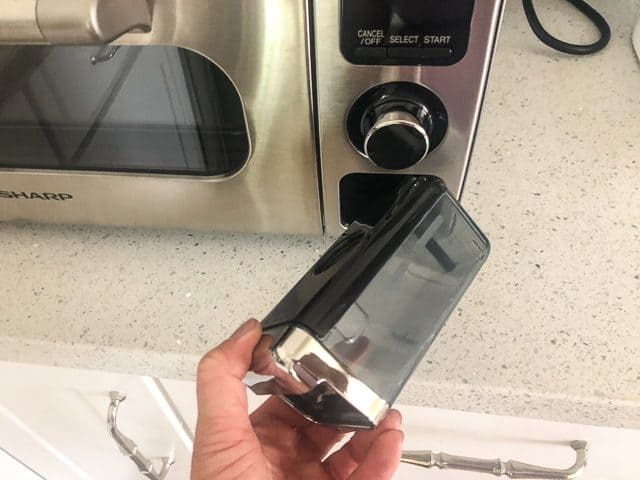 PRO: I tested toast as well (sorry, no photos) – we could fit double the number of slices of bread vs. standard toaster oven. Works really well with bagels – super soft inside, lovely crisp on surface. 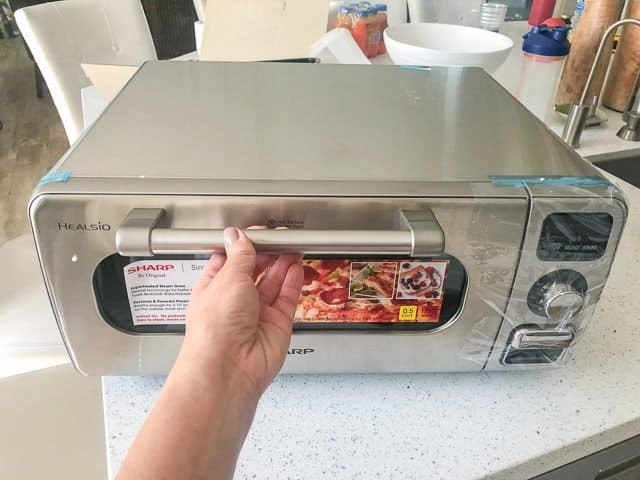 This is a great oven if you and your family enjoy frozen pizzas or any type of frozen foods (works great for frozen appetizers). The large 12″ x 12″ cooking trays gives you plenty of room to cook a full-sized pizza or food to feed a family of 4 (or appetizers for a party). 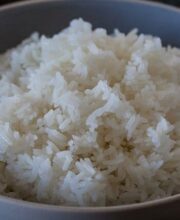 The superheated steam keeps food incredibly moist, without making it soggy. I also love that there’s no need to pre-heat the oven. In addition, the oven is amazing for seafood. Roasting mussels or clams with a bit of white wine is next on my list to try. A drawback of the oven is height. There’s only 4″ of height available for your food. So back to my early convo about baking bread using steam….I could make dinner rolls, but wouldn’t be able to bake a loaf of bread in the oven. That also means a whole chicken would need to be spatchcocked or cut into pieces. PRO: Ohhhh. I forgot to talk about the warming function. Love it. Re-warming leftovers in the oven with steam ensured that the food never dried out. LOVE. 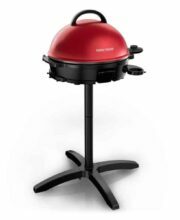 Taller unit – a little more height would allow me to cook pork roasts and whole chicken (which normally can dry out in my regular oven but I’m sure would cook beautifully in the steam oven). Oh and also allow me to bake breads, too. 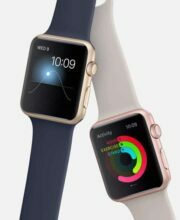 Price: $399 – you can buy it at Fry’s Electronics or Home Depot.